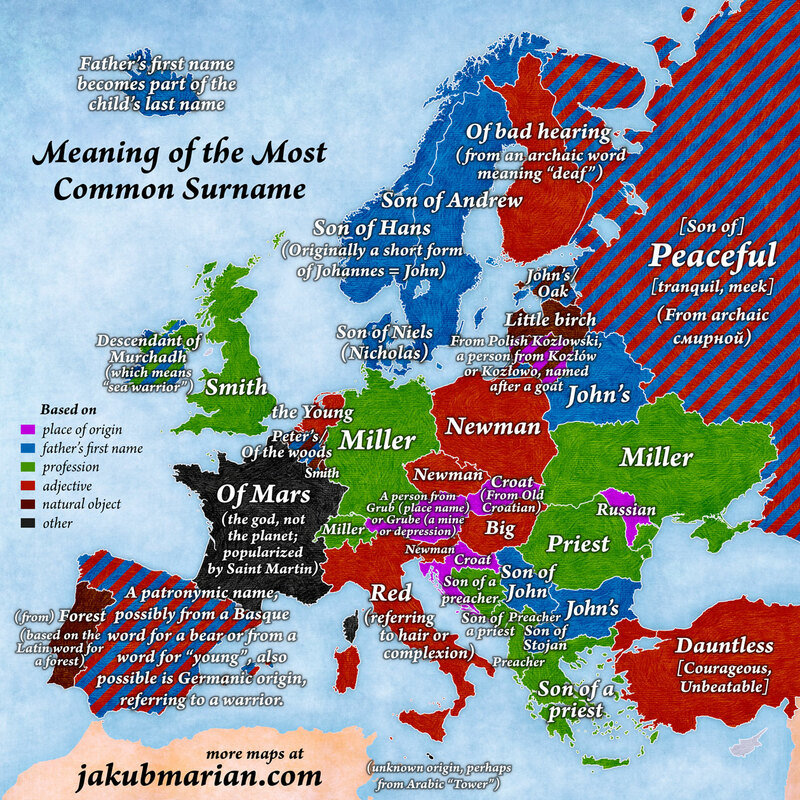 Today’s topic is one suggested to us via conversations on twitter, sparked by this fascinating map (found here) of the meanings of the most popular surnames in different European countries. I pointed out that as a surname ‘Martin’ means ‘child of Martin’, rather than ‘of Mars’ (a reasonable approximation of the etymology of Martin, the given name). It’s a minor point, but an important one, because it illustrates how one and the same element can have different semantic content in different contexts. This sparked questions about why in some cultures you’d find, e.g., Martin while in others it would be Martins and in others Martinson, all to represent the same concept, ‘child of Martin’. While strictly speakings bynames are beyond the scope of the Dictionary, bynames which are derived from given names are close enough to our purview that we thought it would be interesting to devote a blog post to the topic. Let’s begin with some vocabulary. Relational bynames are ones that indicate the bearer’s relationship to someone else. The most common type of relational byname is the patronymic, i.e., one indicating the bearer’s father’s given name. But other types of relational bynames can be found, including ones indicating the bearer’s mother (matronymics), or involving the relationships ‘wife/husband of’, ‘brother/sister of’, ‘niece/nephew of’, ‘grandchild of’, ‘foster child of’, and even more complex relationships such as ‘maternal great aunt’. (These latter ones are of course, much more rare, because only in very specialized circumstances would this information be of importance!) Because patronymics are the most common, we focus on them; some of what we say generalizes to matronymics, but not much further. Patronymic bynames can be divided into two types: marked and unmarked. A unmarked patronymic or matronymic uses the parents’ given name unchanged (i.e., it is not marked in any way to distinguish it from the semantic form it takes as a given name). Marked forms, on the other hand, modify the given name either by changing its grammatical case or by adding a word indicating the relationship the bearer of the byname bears to the person named in the byname, or both. We call relational bynames which change the case of the given name but do not specify the relation in question implicitly marked, and ones which do specify the relation explicitly marked. With this terminology in hand, we can look at the development of patronymic bynames over the millenium after the fall of the Roman empire. Other early examples from France include Clotarius filius Clodovei (DCEL-2, charter XXIX, dated 560), Drogo Dux Burgundiorum, filius Pipini Ducis (DCEL-2, charter CCXIV, dated to 691), Aengilbaldus filius Hildiboldi (DCEL-2, charter CCLVII, dated to 704). This is typical of what you see in the early period: Latin records using explicitly marked patronymics, in the form of filius + the father’s name in the genitive case. Sometimes the father is indicated pronominally, as Arnallus Arnalli de Lerç et Arnallus filius ejus, “Arnal [son] of Arnal, of Lerç, and Arnal, his son” (CDCB-XV, charter MMCCVII, dated to 1090) — so in fact we have here an explicitly marked patronymic with a pronominal reference, and an implicitly marked patronymic, and evidence of three generations of men named ‘Arnal’. A similar pronominal example is seen in a Hamburg charter from 1183, which has Ernestus de Zelezen et filius eius Ernestus (HambUrk-vol1 charter CCLVII). Two other standard examples are found in another charter from the same source: Vergotus filius Dasonis and Hasso filius Heinrici (charter CLXXXVIII, dated 1149). Similar examples are easy to find by flipping through pretty much any charter book from this period. Also by this period we see evidence of the explicit marker, filius, being dropped: Petrum Rigualdi, Bernardum Guifredi, Arnallum Gaucefredi de Palera, Bertrandum Poncii de Melian, and Guillelmum Raimundi de Espasen (CDCB-XV, charter MMCCVIII, dated 1092) were the sons of Riguald, Guifred, Gaucefred, Ponce, and Raimund, respectively. Thus in Latin records, we see marked patronymics, both implicit and explicit. Due to the fact that Latin is a strongly case-based system, unmarked patronymics are not found, because they simply do not make grammatical sense. It is only in the vernacular, in particular, languages which have gradually lost the explicit cases, that unmarked patronymics are found. Even languages that shed most of their cases often retained distinct genitive forms — for example, in English, we have both John (nom.) and John’s (gen.) — and in these contexts we can find both marked and unmarked patronymics. With this background and terminology in hand, let’s survey the different patterns of patronymic bynames that can be found across European vernaculars. Old English: The most common type are explicitly marked patronymics, putting the father’s name in the genitive case and using sune, sune ‘son’ or dohtor, dohter ‘daughter’. Examples: Osferð Oggoddes sune (972×992), Ælfelm Ordelmes sunu (c. 1060), Wulfeh Ordeges suna (973×987) [Tengvik, p. 161]. A less common form added -ing to the root name, e.g., Dudding ‘son of Duda’ [Reaney & Wilson, p. xix]. Middle and Early Modern English and Scots: All three types of bynames can be found in Middle and Early Modern English: Unmarked patronymics, such as Thomas Richard 1276; marked implicit patronymics, such as William Ricardes 1327; and marked explicit patronymics, such as Murdac Richardesson 1359 [Reaney & Wilson, s.nn. Richard, Richardson]. The explicitly marked forms, especially those found in the north, are often attributed to Scandinavian influence, but there is no reason not to credit the surviving influence of the Old English patterns. In the Lowlands of Scotland, the vernacular there developed out of English, and used the same types of patronymic constructions. Old, Middle, and Early Modern Irish: Exclusively explicitly marked patronymics, using mac ‘son’ or ingen (OIr/MIr)/inghean (EMIr) ‘daughter’. Examples: Aneislis mac Domnaill (1049), Dobhailen, mac Gormghusa (885), Gormlaith ingen Donncadha (861), Rois, ingen Concobuir, mic Concobuir (1472) [Irish Annals]. Welsh: Both unmarked and explicitly marked patronymics occur. In unmarked forms, the father’s name is simply appended to the child’s name, without any modification; as a result, patronymic bynames in Welsh are often mistaken, by those who don’t know about the unmarked patronymic construction, as examples of double given names. However, multiple references to the same person can make it clear that, e.g., Jenkin Owen and Jenkin ap Owen are variants of the same name. In marked forms, the father’s name occurs unchanged after the relevant word for ‘son’ or ‘daughter’, with one type of exception. The name doesn’t change its grammatical case, but it can ‘inherit’ the end of the word for ‘son’, ap or ab. The final bilabial stop (voiced or unvoiced) sometimes attaches to the beginning of the next word, and this is the origin of modern surnames Price (ap Rys), Bevan (ab Evan), Bowen (ab Owen), etc. Sometimes in 16th C English contexts, one can find hybrid forms, such as ap Price [Hughes, passim]. French: Old French distinguished two cases, the nominative and the oblique. Marked patronymics were formed using the oblique case, either with or without the preposition de ‘of’; but from the modern perspective, most French patronymics end up looking unmarked. This is because the use of the preposition de was much less common than simply using the oblique form (though in the 1292 census of Paris, one can find bynames such as de Lorenz, de Nicole, de Nichole, de Remy, and de Touz-Sainz alongside the more common pattern without de); and, more importantly, while in other languages, it was the nominative form of the name that became the fossilized form when the case system disappeared (as happened in English), in French, it was the oblique that eventually eclipsed the nominative. As a result, Wautier, Simon, Rogier, and Jehan are the ‘expected’ forms of the names, when in fact it is Wautiers, Simons, Rogiers, and Jehans that are the nominative forms. But by the time Middle French comes around, it was the oblique that had become the default form, so that, e.g., Martin would be the form used in both Jehan Martin ‘Jehan [son] of Martin’ and Martin Jehan ‘Martin [son] of Jehan’. Spanish and Portuguese: These two linguistic contexts can be grouped together due to their strong similarities, regardless of whether we’re looking at Galician, Castillian, Catalan, Portuguese, or other. The vast majority of the vernacular bynames in these regions were marked but implicit. Many modern day familiar surnames of Iberian origin reflect this: Sánchez from Sancho, Rodríguez from Rodrigo, López from Lope, Hernández from Hernando, González from Gonzalo, Gutiérrez from Gutierro, Martínez from Martín, etc. (All of these can be found in late 16th C records [Catalogo].) In Portuguese similar constructions can be found, such Guonçallvez from Guonçllo, Anrriquez from Annrrique, and Fernandez from Fernão. Some instances of unmarked patronymics can be found, e.g., Dinis, Duarte, Francisco, and Felipe. Quite rarely, a combination of a grammatically marked form with an explicit preposition can be found, e.g., de Lopez, d’Allvarez or d’Allvariz, and de Çesar (these all come from [Livro]). Italian: Italian patronymics are, compared to some cultures, gloriously simple. You take the father’s name (or the mother’s name) unmodified, and place di ‘of’ before it, as is exemplified with these names from early 15th C Florence: Antonio di Donato di Nuccio da Chascia, Antonia di Nanni, Buonaghuida di Martino, Giovanni d’Andrea di Maso funaiuolo, Piera di Giovanni da Monteaghuto. Occasionally, the word for ‘son’ or ‘daughter’ is included, as can be seen in the name Simona figliuola di Simone de Bardi [Herlihy & Klapisch-Zuber]. German: Medieval German retained a strong case-based system throughout the Middle Ages, distinguishing the nominative, genitive, dative, and accusative. Despite this, the most common type of patronymic byname in German contexts is the unmarked patronymic. Examples involving the addition of -sohn can be found, but they are much, much rarer. In the 15th and 16th centuries, an interesting pattern can be seen amongst women’s names: Women occasionally use as their byname their husband’s or father’s full name, but with a feminine or possessive suffix on the end, e.g., Allet Petter Schelhornyn, Katterina Crista Puffanyn, Margreth Ulrich Rottmundin, Helena Wilhelm Rumlin, Anna Fricz Ditterichs, Anna Kuncz Heßin, Kun Mertten Flinderin, Katterina Herman Schneiderin, and Kun Fricz Fruppassin [Nurn1497]. Dutch: In contrast with German, where explicit markers for ‘daughter’ and ‘son’ are rare, the default Dtuch (including Flemish/Belgian) patronymic is explicit. For example, one sees Aelbertssoen more frequently than Aelberts, Aerntssoen and Aerntszoon rather than Aerts, Claessoen and Claiszoon rather than mere Clais [Smit, passim]; nevertheless, the implicitly marked and the unmarked versions can be found, in lower frequencies. Scandinavian: Just as we can dump all the Iberian languages together, so too can we treat the Scandinavian languages (Icelandic, Norwegian, Swedish, Danish, and their regional dialects) in one group: Far and away the most common type of patronymic is the marked explicit patronymic, with some variation of the word for ‘son’ or ‘daughter’ followed by the father’s given name in the genitive case. Exceptions to this pattern are rare; when they occur, it is sometimes difficult to tell whether the word for ‘son’ has been omitted, resulting in an implicitly marked patronymic, or whether the name has simply been abbreviated in written contexts. We haven’t even touched on the constructions found in Eastern Europe, such as Polish, Czech, Hungarian, etc. Perhaps we can devote a future post to these! Herlihy, David and Christiane Klapisch-Zuber, Census and Property Survey of Florentine Domains in the Province of Tuscany, 1427-1480. Machine readable data file. Online Catasto of 1427 Version 1.1. Online Florentine Renaissance Resources: Brown University, Providence, R.I., 1996. Hughes, H. Seymour, The Registers of Llantrithyd, Glamorganshire. Christenings, 1597-1810; Burials, 1571-1810; Marriages, 1571-1752 (London: Mitchell and Hughes: 1888). [Irish Annals] (1) Donnchadh Ó Corráin, ed., “Annals of Tigernach” (WWW: CELT: Corpus of Electronic Texts: a project of University College, Cork, Ireland, 1996) [URL: http://www.ucc.ie/celt/published/G100002/%5D; (2) Donnchadh Ó Corráin, Mavis Cournane, ed., “Annals of the Four Masters, Volume 1” (WWW: CELT: Corpus of Electronic Texts: a project of University College, Cork, Ireland, 1997) [URL: http://www.uccre.ie/celt/published/G100005A/%5D; (3) Donnchadh Ó Corráin & Mavis Cournane, “The Annals of Ulster” (WWW: CELT: Corpus of Electronic Texts: a project of University College, Cork, Ireland, 1997) [URL: http://www.ucc.ie/celt/published/G100001A/%5D. [Livro] Livro do lançamento e serviço que a Cidade de Lisboa fez a ed Rei Nosso Senhor no ano de 1565; documentos para a historia da Cidade de Lisboa. (Lisboa: Câmara Municipal, 1947-48). Smit, Johannes Gradus, Bronnen voor de economische geschiedenis van het Beneden-Maasgebied: Tweede deel, Rekeningen van de Hollandse tollen, 1422-1534 (Den Haag: Instituut voor Nederlandse geschiedenis, 1997). Tengvik, Goesta, Old English Bynames (Uppsala: Almqvist & Wiksells Boktryckeri-A.-B., 1938).